Just accept it now. On all of your checks, occupational paperwork, and other important documentation, you are going to write 2015 for approximately 4 weeks. If you are lucky, you will cease this trend before February, but let’s just all agree that there is grace for those who do this. Don’t worry. You will learn to correct this mistake. You will also go to the gym religiously until February 19th and then life will make it harder to commit. Okay, so I may not be giving humanity enough credit, but whatever our fate may be in 2016, it is vital to look back on the previous year to reflect on the lessons that we learned. For me, there could be a hundred pages filled with nuggets of wisdom I have gained. Today, I want to talk about just 7 of them. This lesson is a hard one for many believers to accept. We often think that, in order for God’s plan to be holy, beneficial, and redemptive then it has to pass through our mental and emotional filter. The fact is God has an amazing and powerful plan for each one of us, and the more we fight Him on this, the less joy we get out of the process. We must learn to trust even when it doesn’t make sense. When I see the bumper sticker, “God is my co-pilot”, I have want to ask why. The reason for this popular cliché is probably because humanity has a tendency to want to be in control. Scripture tells us that God does not belong in the passenger’s seat, or even in the driver’s seat (sorry Carrie Underwood), but He is the road, the signs, the car, the engine and the fuel. My prayer life has changed from, “God, please help” to, “Lord, please guide”. I have learned that God desires for me to be ready for His will not impose mine upon Him. I could be the best preacher in the country, but if my spiritual walk does not match the words that are coming out of my mouth then I am a fraud. People don’t want to just hear about Jesus; they want to see Him in action. This is not only in my life that is lived outside of the church doors, but also in the life I live in private. When we feel hurt, afraid, or disappointed it is easy to tell ourselves the lie that we can do better on our own. We think the remedy for alleviating all hurt is isolation. When this line of thinking is embraced, we see things like addiction, self abuse, and depression talk full hold. God made us for His glory, but His glory can be seen in the context of community and pouring into the lives of others…or allowing others to pour into us. I can’t tell you how many people I have ministered to that had no desire to grow, but only the desire to be served. This may seem harsh but there has to come a point where we start to own our mistakes, faults, and the scars of our past and seek to overcome the hurdles. Sure, there is grace and mercy available for all, and there are none that lack a certain level of brokenness, but we can’t stay there. As a Christ-following community we must understand what it means to love, and serve, but to also allow people to be stretched in their faith. Pain can be our biggest catalyst for growth. In my experience, I have realized that sometimes I don’t allow myself to grow, because what I am doing is still Godly, and it is also comfortable. I stand in my own way. I am fortunate enough to have been born into a legacy of believers that has seen the power of prayer. This doesn’t mean, however, that I do not become discouraged when God does not answer when I expect Him to. What if God plans to answer our prayer, but it is not imperative that we have a hand in it? Think about Moses. Moses’ prayer was that his people would be set free, and given their own homeland just as God promised. The Lord honored this prayer in His timing, and the people inherited a land that was fertile, rich, and accommodating. Moses, though, did not get to experience it. It may be hard to hear, and maybe you will see the answer, but God’s plans are bigger than your wants, fears, and even dreams. It could also be that God is waiting for you to let go of the outcome. Keep praying, but surrender to whatever the answer may be. Don’t let your feelings dictate your prayers. I cannot rely on other people, situations, or outcomes to control my level of contentment. This posture is one that stems from a decision in my own heart and mind. As Christians, this lesson can be a tempting one to disregard. Sometimes, when something looks discouraging, we tend to equate that with “God’s leading” and thus avoid any more hurt. In all actuality, He could have a completely different purpose for allowing you to go through it. Personal growth, of course is the goal when faced with difficulty, but perhaps the goal is also the growth of someone else. 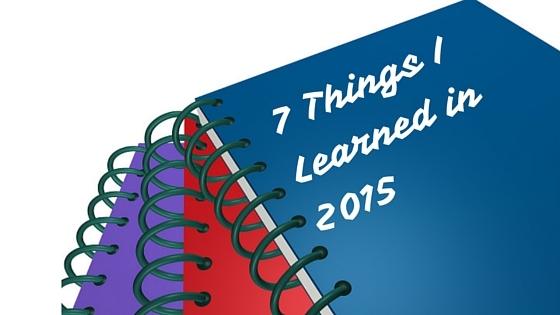 As you anticipate what 2016 will bring, look for lessons you can reflect on. Don’t just survive. Too many people use prayer as a way of ‘getting’ things and fail to understand what the work of prayer accomplishes within the praying person. Thanks for the reminder.